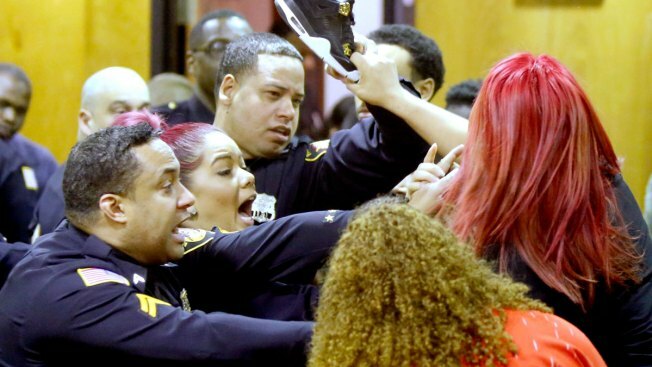 Sheriff's Deputies keep Debora Hernandez, right, the mother of Antonio Vega's daughter, from hitting a defendant's family member with her shoe after an altercation between the two groups broke out at the end of a hearing where Clarence Williams and Gerry Thomas made their appearances for murder, Friday, March 24, 2017, in Paterson, N.J.
A melee broke out Friday at a hearing for a pair charged in the deaths of two men found in a burning car owned by a woman who often appears on "Real Housewives of New Jersey." Clarence Williams and Gerry Thomas, in court for a detention hearing, were ordered held without bail when the brawl broke out. The two Paterson residents previously pleaded not guilty to murder charges in the deaths of Aaron Anderson and Antonio Vega Jr., who were found last week inside a burning Audi. The car was owned by Kim DePaola, who often appears on the Bravo reality show. Anderson's mother has said he borrowed the car from DePaola's son. The judge warned the families of the suspects and the victims to keep their emotions in check and remain composed. "I understand you have very strong feelings and may want to blurt something out," Passaic County Superior Court Judge Ernest Caposela said. But an argument broke out, and people in the gallery yelled obscenities and threw objects. Thomas' attorney, Gregory Aprile, shouted to the judge during the brawl that he wanted the names of everyone involved. Aprile said he may ask that they be banned from future proceedings. Charges are pending for one person involved in the altercation, according to the Passaic County Sheriff's office.